FOTO meets at Twin Oaks Park on the first Friday and Saturday of each month. Many like to arrive a day or two earlier. Fellowshipping is the primary reason for FOTO. There is always plenty of good-hearted laughter and companionship. Playing bluegrass related music is another good reason to gather. There are always jam sessions at each FOTO gathering. While we’re certainly not an overly rowdy bunch, there is no quiet time; so be prepared to fall asleep to some soothing tunes. Several members enjoy friendly card games. You don't have to play an instrument or cards to enjoy FOTO. You only need to be a kind person. If you'll visit with our "FOTO Photos" section and you'll get a good idea of what we're all about... Eating, playing music and laughing. We have fun. Friday - 5:00 pm - A "light" supper provided by your previous cash donations. You only need to bring your appetite. Saturday - 10:00 am - Breakfast. We'll start cooking around 9:00. Bring what you have to share with the group. Saturday - 5:00 pm - Covered dish supper. Twin Oaks Park and/or FOTO provides the main meat dish. Everyone should bring a dish or dessert of your choosing so that nobody ever goes away hungry. If you are unable to cook for dinner, store-bought desserts, deli dishes, breads or any other items are welcomed additions. Hot coffee, iced tea (at dinner), plates, cups and tableware are all provided by FOTO by your cash donations. A donation can is available near the serving line. Your generousity is appreciated and used only for supplies and items to improve FOTO. 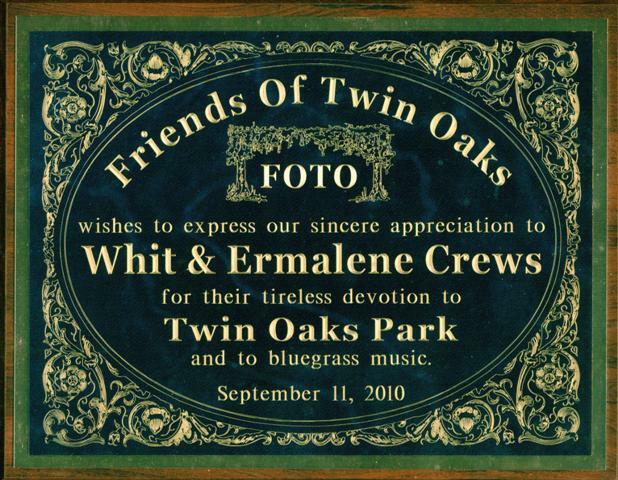 See www.twinoakspark.com for a listing of their bluegrass festivals and other events happening at the park.